The Novena in honour of the Sacred Heart takes place on nine days leading up to the Feast of the Sacred Heart. This is a moveable feast which falls 19 days after Pentecost, on a Friday. Dates for the 2018 Novena are from the 1st to the 8th of June. Click here for for an set of Novena Prayers on the Sacred Space website. Claude La Colombière (1641-1682) enjoyed an intense, if brief, life, notable for the part he played as champion of the devotion to the Sacred Heart. He is remembered principally as the spiritual director who recognized the truth of the revelation that St. Margaret Mary Alacoque received; he also showed heroic virtue in enduring imprisonment that weakened his health and led to an early death. Colombière was born in southern France and studied at a Jesuit school from an early age. He entered the Society of Jesus when he was 17 and followed a normal course of studies: grammar, literature, philosophy and theology. After teaching for a few years in Avignon, he studied theology in Paris and wasordained April 6, 1669. He taught for another three years and then became preacher at the Jesuit church in that city before going on to tertianship. During that year of prayer and reflection, he felt moved to take a special private vow to obey all the rules of the Society in the most strict manner possible. The French Jesuit's first assignment after tertianship was to be superior of a small community in Paray-le-Monial, where there was also a convent of cloistered Visitation sisters. One of them was Sister Margaret Mary Alacoque to whom God's presence in prayer was revealing a message of divine love. Some other members of her community thought her prayer was a delusion, and their skepticism caused her suffering. She received assurance from the Lord, however, that he was sending her his "faithful servant and perfect friend." Colombière became the confessor of the convent and Sr. Margaret's spiritual director. She opened her soul to him and told of the supernatural events taking place in her life. He had the insight to recognize this prayer as a real gift from God and a true revelation. In his own prayer, Colombière came to learn the Lord's wishes more clearly. In June 1675 the Lord made an explicit request regarding the devotion to his Sacred Heart, asking her to establish the Friday following the octave of Corpus Christi as a special feast and to tell Colombière to do all he could to spread this devotion. Colombière's time in Paray-le-Monial lasted only until October 1676 when he was assigned to be the preacher to the duchess of York in London. Although England was officially non-Catholic, King Charles II allowed his brother the Duke of York to have a chapel in St. James Palace. The chaplain had to come from outside England; so the young French Jesuit left his own country to live in a foreign court. 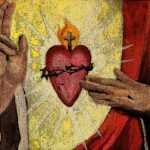 He continued to preach what was most dear to him the message of Christ's love for humankind, symbolized by his Sacred Heart. The sermons resonated with the duchess who years later became the first royal personage to petition Pope Innocent XII to establish a solemn feast in honor of the Sacred Heart. Royal forbearance did not protect the Jesuit from betrayal by a Frenchman whom Colombière had befriended in London. In November 1678 the man falsely denounced the Jesuit to the government in order to win a reward. Colombière was arrested on charges of traitorous speech against the king and parliament and placed in a cold dungeon where his health rapidly deteriorated. He was released after a month in prison, but the damage was done. He returned to France and slowly headed south, stopping frequently when weakness overtook him. He arrived in Lyons on March 11, 1679 and stayed there as a spiritual father to the young Jesuits in the school where he himself once taught. He continued to preach about the Sacred Heart, but his own health did not improve so superiors sent him back to Paray-le-Monial in 1681. Although he loved the place dearly, he could not recover. In early February 1682, a fever took him; when he died on Feb. 15, he was only 41 years old.